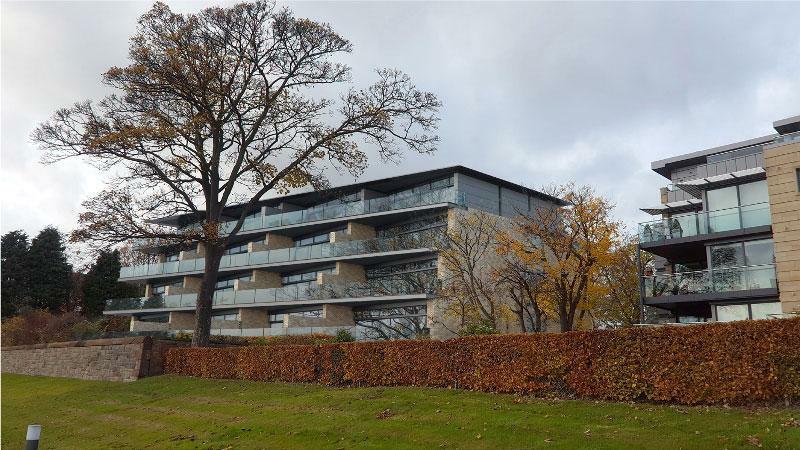 Our new building in Dunfermline, the result of an architectural competition won ten years ago, opened its doors on 18th May and has been heavily visited ever since. 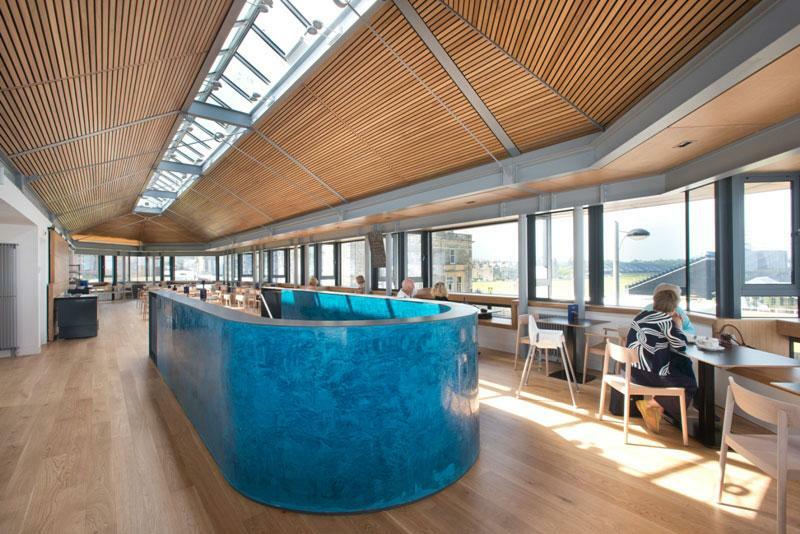 Comments from the public have been universally positive and the building was awarded the Edinburgh Architectural Association “Best Large Project” and “Building of the Year 2017.” In addition it was given an RIAS award and is consequently shortlisted for the Doolan Prize for the best building in Scotland 2017. We are also delighted that the RIAS also gave our client, Fife Council, their “Client of the Year 2017” award. The picture shows the building from the Abbey graveyard and the RIAS Awards Ceremony, from left to right: Martin Lambie (RMA), Lorraine Landels Hon FRIAS (Buro Happold), Stewart Henderson PRIAS (President of the RIAS), Dallas Mechan (Fife Cultural Trust), Kris Grant (RMA), Kevan McLaughlin (Fife Council). Irish President Michael D. Higgins officially opened our building on the Galway campus of the National University of Ireland on the 10th April. Another joint project between ourselves and Taylor Architects of Castlebar, Co Mayo, we were delighted that the Royal Incorporation of Architects in Ireland announced at their annual awards ceremony that it had been voted “Ireland’s Favourite Building” by a popular vote. Over 14,000 votes were registered and it beat over 60 competitors. 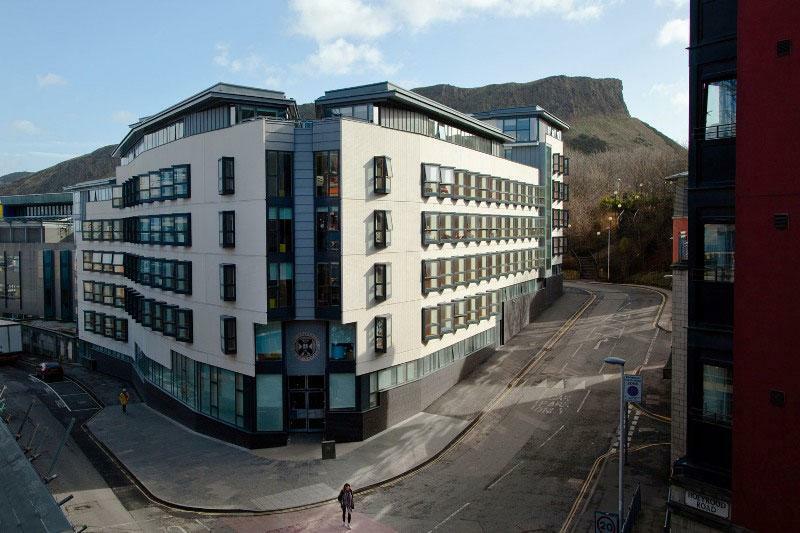 HRH The Princess Royal, Princess Anne officially opened our postgraduate student housing at Holyrood South, completed three years ago. Richard, Bill and Kris were in attendance. Princess Anne is the Chancellor of The University of Edinburgh. We are delighted to be part of the team headed up by Cubic chosen by Ards and North Down Council to regenerate the sea front of Bangor in Northern Ireland. The master-plan is by Faulkner Brown Architects and our role will be to develop proposals for a sea-front hotel. Our project for a new Science Faculty building is only months away from completion and the University have asked us to look at a feasibility study to reorganise their Arts Faculty building, the Ruskin Building, which is the oldest building on their Cambridge campus. 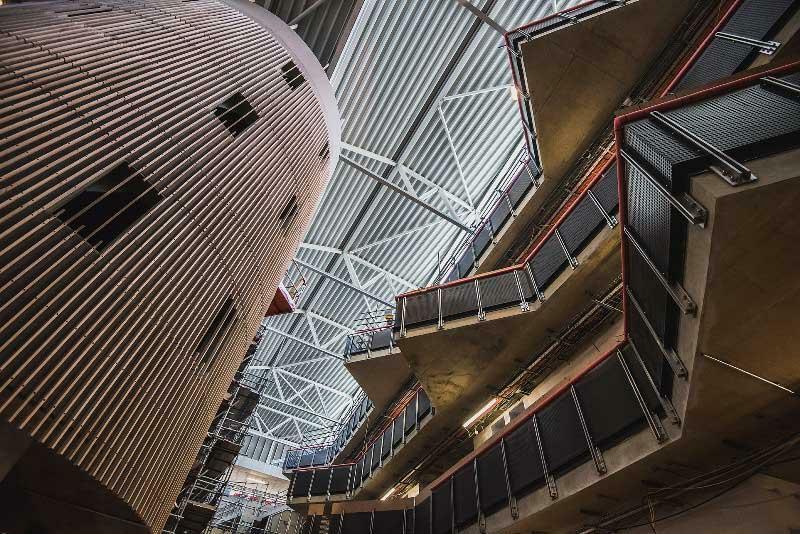 We are delighted to be continuing our very successful relationship with the University which began with the commission for the new Young Street development, completed in 2015. Our project to replace an existing house with 16 apartments has been passed by Edinburgh Council and we are currently working towards a building warrant submission. The project is expected to be on site in early 2018. There is a large variety of apartment types but with each of the apartments having spectacular views of the skyline of Edinburgh Castle and Old Town. We were obviously disappointed not to win the St Andrew Square Edinburgh Concert hall competition but our proposals can be seen on a new webpage. 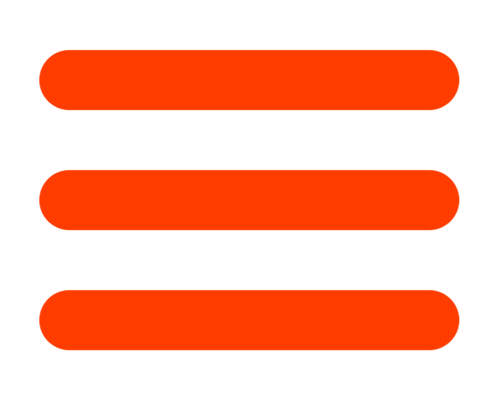 We look with interest to see how the project develops. 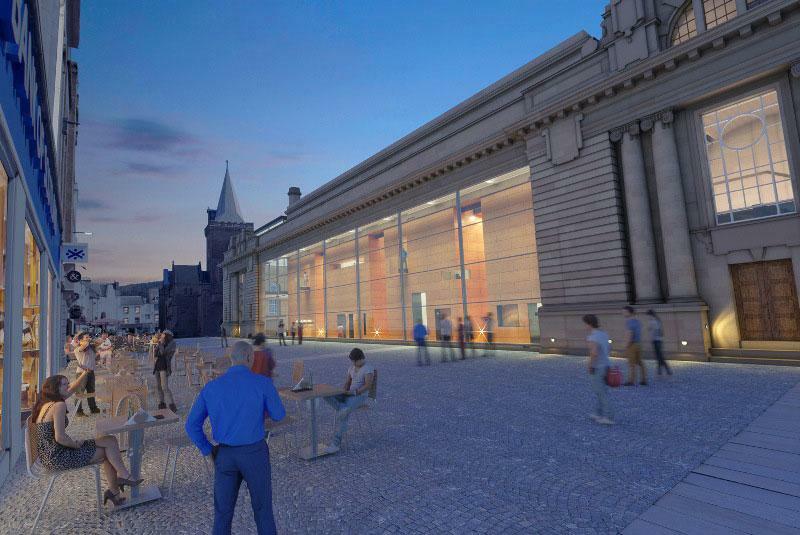 Meanwhile we have submitted proposals for the conversion of the former City Hall in Perth into a new gallery and museum for the city. 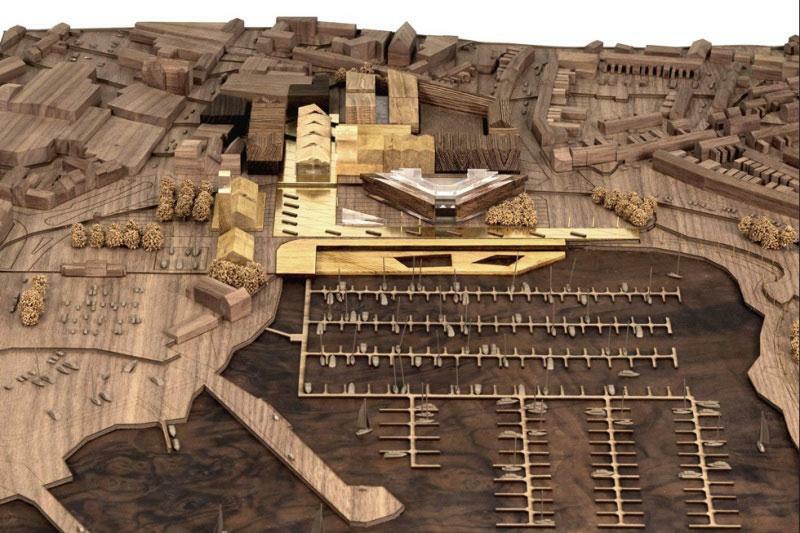 All five competitors' proposals were on public exhibition and you can also see our proposals on a new webpage. An announcement of a result is not expected until August. Meanwhile we are immersed in the competition for a new Convention Centre in Heidelberg Germany and are working with local partners Schneider + Schumacher of Frankfurt. We have a number of projects on site at the moment. They include a new house in Dalkey near Dublin, an 80 bed Acute Mental Health Facility at City Hospital, Belfast in association with RPP Architects of Belfast, an extension to our own theatre at Caernarfon, the extensions and renovations to Perth theatre, the conversion into residential use of Donaldson’s Deaf school for City & Country, the construction of new apartments for Cala Homes on the same site and a new house on Tipperlinn Road, Morningside, Edinburgh for private clients. Photographs above: (Top Left) House at Dalkey, Ireland; (Top Right) 80 Bed Acute Mental Health Facility, City Hospital, Belfast; (Middle Left) Perth Theatre, (Middle Centre) Donaldson's Edinburgh, conversion of the historic buidling into aparments by City & Country; (Middle Right) Donaldson's Edinburgh CALA Homes new build apartments to the rear of the site; (Bottom Left) Anglia Ruskin University, Cambridge, Science Centre, Super lab; (Bottom Right) House at Tipperlinn Road, Edinburgh. 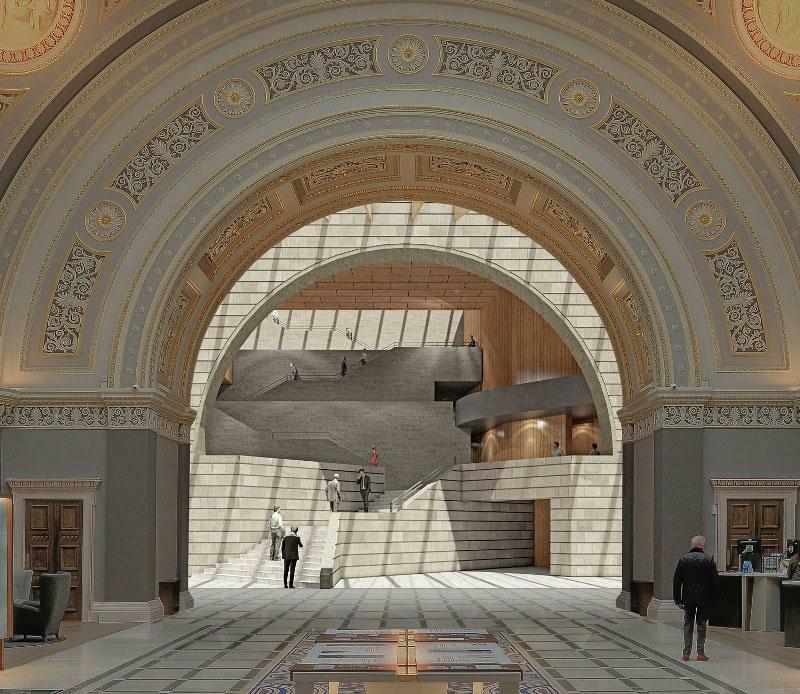 The controversy over the future of this very important building continues. 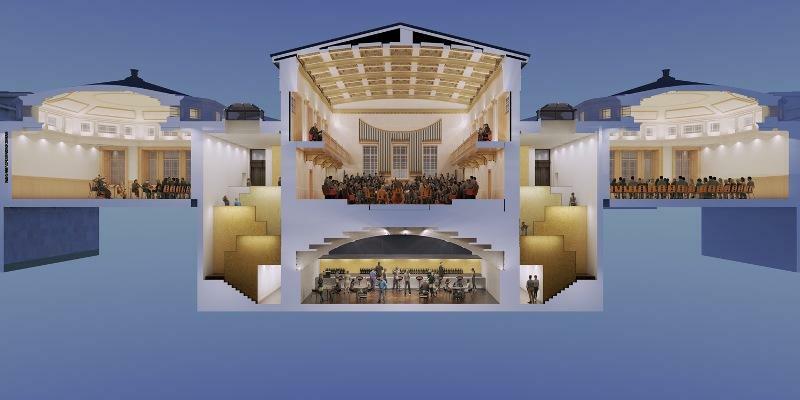 While there is no clear date from Edinburgh Council Planning department as to when a current planning application for hotel conversion is to be considered, our clients the Royal High School Preservation Trust (RHSPT) have been busy rallying support for our own consented proposals to convert the building into a music school for St Marys Music School. A survey of opinion in Edinburgh conducted by IPSOS Mori showed that 81% of Edinburgh residents preferred the RHSPT’s proposals. Meanwhile a musical rally “Perfect Harmony” was held at the Canongate church on 22nd June where children performed with the school in the background seen through the church’s window. You can follow developments on the RHSPT webpage. We have featured heavily in both the professional and popular press recently. The “Best Building in Ireland Award” for the O’Donaghue Centre in Galway was covered in the Irish Times, the Irish Examiner and the Galway Independent. The Dunfermline Carnegie Museum and Gallery opening and awards featured in the Scotsman, the Dunfermline Press and Scottish Construction Now. Best of all we found ourselves on the front and back covers of the June issue of the monthly magazine, “Architecture Today.” The front cover features Dunfermline with inside a six page article by Charles Rattray. 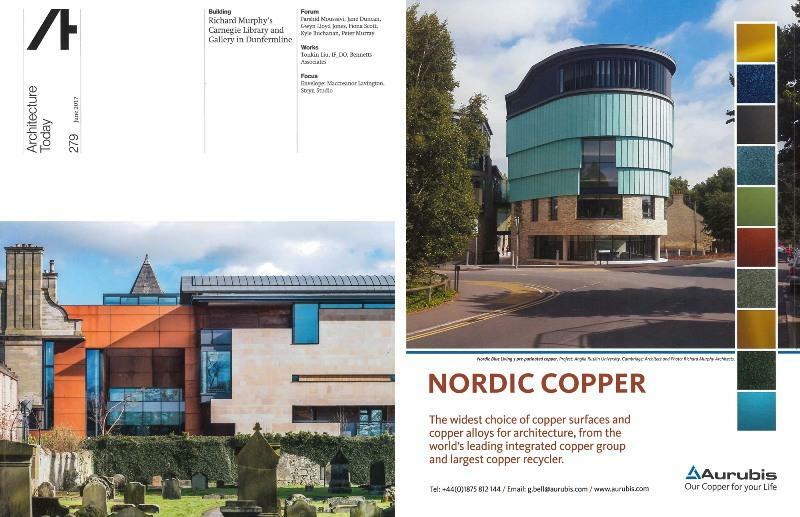 He called the building “a dramatic tour de force”, and by coincidence a full page advertisement on the rear for Nordic Copper featured our Young Street project for Anglia Ruskin University in Cambridge! The RIBA Journal will also be featuring Dunfermline shortly. The Perth competition designs from all the competitors featured in the Architects Journal, Scottish Construction Now and the Dundee Courier who ran a public vote which is still live. You can vote by going here. BBC Scotland also interviewed Richard about Dunfermline on the “Janice Forsyth Show.” and Richard will be part of the judging panel for this year’s “RIBA UK House of the Year” which will be seen on Channel 4 Grand Designs in the Autumn. On the 8th May Richard spoke to friends of the Dunfermline Carnegie Galleries and Museum for a pre-opening talk and tour of the new building. On the 10th May he lectured to the Bristol Society of Architects in the Arnolfini Gallery Bristol on the work of the practice and also on 13th May, (in Italian!) in Verona as part of the Mantua Architecture Festival. On the 15th June he was the principal guest speaker and judge of the Manchester Institute of Architects Annual Awards. He will be lecturing about our work to the Malaysian Society of Architects in Kuala Lumpur on the 15th November. Watch out also for various book launch dates in September and October for the launch of his new book “Carlo Scarpa and Castelvecchio Revisited.” This is now at the printers. Book launch events are expected in Edinburgh, London and Verona. The book will soon have its own website where orders can be taken.